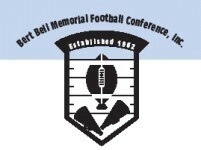 The Bert Bell Memorial Football Conference is founded to further the ideals of the game of football at the school level. Its general purpose is to strive to equip boys with the mechanical skills, physical condition and mental attitude necessary for the pursuance of the game at the high school and college level. Also, to teach through supervision and by example the principles of sportsmanship and fair play, without undue emphasis on winning or losing. This program shall be implemented in such a way as to make no sacrifice to scholastic achievement. Contrarily, it shall be the purpose to teach participants that eligibility for athletic activity is based on satisfactory performance in the classroom.